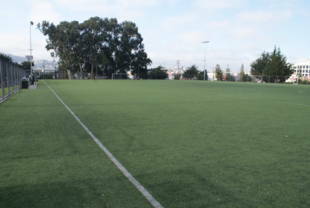 This 5.6 acre park contains a newly-renovated artificial turf soccer field with lights, several picnic areas with benches, public restrooms, and a newly renovated playground. 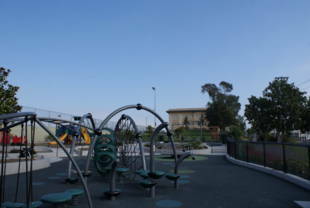 The new playground opened in spring 2009. 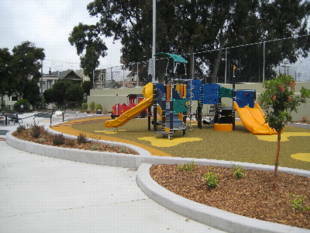 It has rubber surfacing and a sand play area along with many play structures. 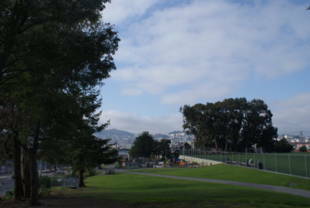 Franklin Square is owned by the San Francisco Recreation and Parks Department. 22-Fillmore, 27-Bryant and 33-Stanyan -- 16th Street and Bryant stop. Franklin Square Park began in 1868, when 4.4 acres between 16th and 17th, Bryant and Hampshire Streets, were purchased for $576,000. Ten years later the Board of Supervisors approved a bill to 'immediately borrow $100,000 in gold coin' and park commissioners allotted $12,000 'to immediately grade, fence, plant and improve Franklin Park and conduct water pipes therein.' (Alta California, 1878). The park suffered a temporary loss of identity in 1950 when it was renamed Father Crowley Playground after the original Father Crowley Playground at Seventh and Harrison Streets was demolished to make room for the Bayshore Freeway. Subsequently its original name was returned to Franklin Square and the Rev. D.O. Crowley joined other memorable names in Recreation and Park history. (San Francisco City-County Record, 1936). As more families were drawn to the neighborhood and into the park, increased complaints about deteriorating conditions and a lack of recreational facilities for small children were heard. At a public hearing in 1969, the Park Commission was offered a renovation plan by the United Neighborhood Association. Its fate remains unknown. Franklin Square's soccer field got its start in an appropriation for construction in a 1984 Commission meeting. In constant and vigorous use since it was built, it was approved for extensive renovation and expansion in 1995. Completed and officially celebrated in January of 2004, the enlarged-to-regulation-size field has a new irrigation and drainage system and state-of-the-art synthetic turf that looks like grass, which outlasts all other varieties and is safer to play on. Games at this 'permit only' facility are booked by clubs and schools from all over the area at $40 for 2 hours. 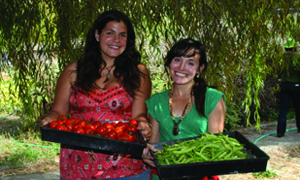 Workdays are on the third Saturday of each month.